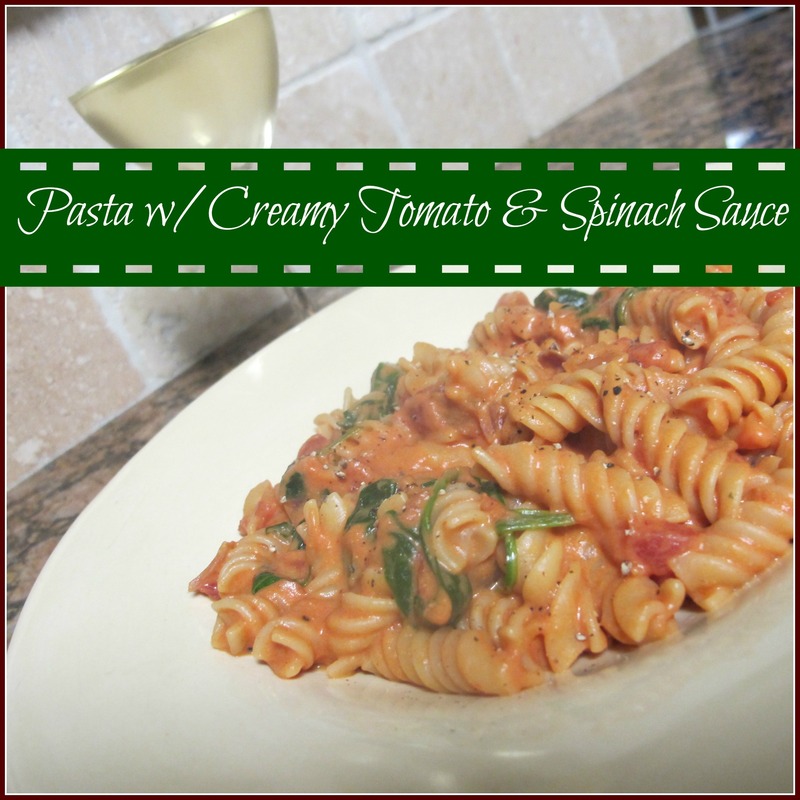 For starters, this week’s Pinspiration is a recipe is adapted from this pin I saw for Creamy Tomato & Spinach Pasta. It sounded really similar to something my friend Stef makes that my 10 year old loves, so I thought I’d try and adapt it and make it a little more simple and kid-friendly. Here’s how it turned out – the kids loved it, us too! All totaled it was only about 20 minutes prep time too. I didn’t have Penne, as they use in the Pinterest recipe so I went with Rotini. Boil water and cook your pasta. In a separate, large saucepan on a medium-heat stovetop, two generous turns of your favorite extra virgin olive oil. Toss in your diced red onion and cook for 3-5 minutes. Add in your can of diced tomatoes and tomato paste. Stir. Add in a 1/2 cup of water. As that’s going on, add in your cream cheese. It’s easier melting if you cube it up a few times. Stir it all together so the sauce is all mixed. Add in your spinach and cook on medium heat until it wilts. Your pasta should be done by now. 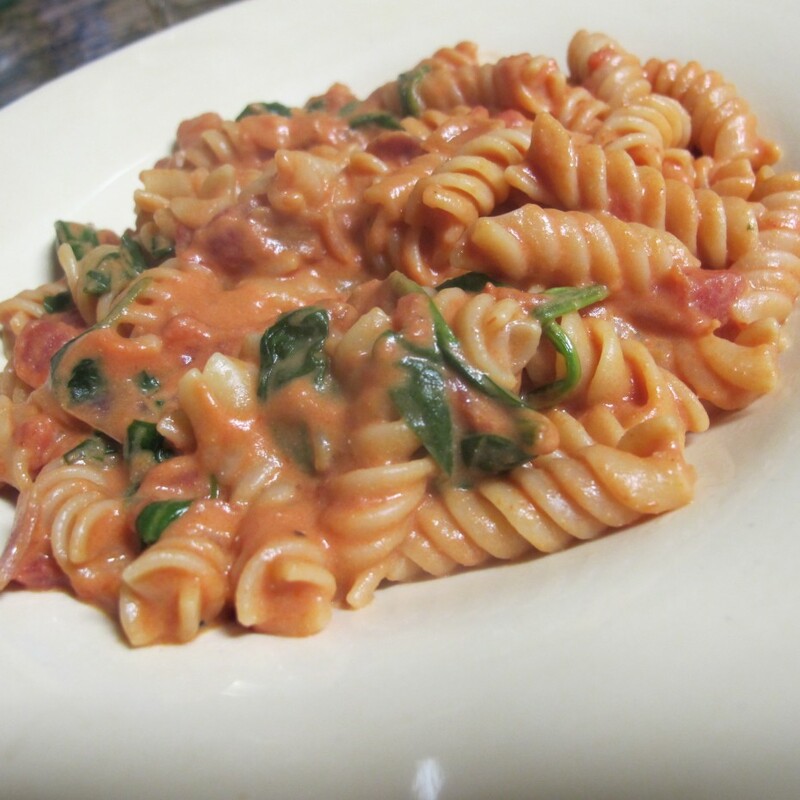 Once the spinach has wilted, stir in your pasta and make sure you coat it evenly with the sauce. Serve hot! Add fresh ground pepper and salt to taste. And parmesan too if your kids want it! Just looking at the photo and I am drooling!!!!!!!!!!!!!!!!!!!!!!!! Sounds so adaptable..I would even add sauteed italian sausage. Yummo!!!!!!!!!!! !